I was delighted to be invited by the Chianti Classico Wine Consortium to attend a Gran Selezione seminar and walk around tasting at the New York Public Library a few months back. Following the excellent ‘An Exploration of the Terroirs of Chianti Classico’ master class*, the afternoon tasting featured Chianti Classico producers and importers/distributers presenting in addition to Gran Selezione wines; both their Chianti Classico and Riserva vintages. It was a fantastic opportunity to taste a wide variety of wines, many of which are still in need of US importers. *For my impressions on the wines and class please check out Gran Selezione: The New Big Brother in the Chianti Classico Family . One of the highlights of the afternoon was the time I spent talking with Orsola Beccari, owner of Vignavecchia. Located in the Province of Sienna, the 42 hectare estate was founded in 1876 by her great grandfather, the pioneering and dynamic-spirited Odoardo Beccari. The land he inherited has winemaking origins dating back to the 17th century. Orsola proudly gave me a few highlights of his remarkable life, from starting out in the world as an orphan in Florence, to his explorations and research into Sarawak, Brunei and other islands off present-day Indonesia, Malaysia, and Papua New Guinea. He discovered many new plant and animal species there, and upon his return to Italy in 1878, he briefly became the Director of the Botanic Garden of Florence. His botanical collection garnered thru all of his years of exploring is now part of the Museo di Storia Naturale di Firenze. There is also an archive of his work at the University of Florence and the Museo Galileo. Upon retiring, he became devoted to winemaking, and today Orsola cares for and continues to advance the traditions he founded. With an emphasis on preserving the land and environment, she leaves nearly half of the land in its natural woodland state, with 19 hectares of vines and 3 given to olive groves. Orsola explained that her Sangiovese and Canaiolo grapes are not as deeply coloured as other traditional Chianti grapes can be, however they result in wines that are noted for their deep, intense perfume, along with a bright acidity and relatively moderate alcohol levels. She credits the soils and climate, specifically the low temperatures combined with higher altitudes at which the grapes are grown, for these distinctive characteristics of the estate’s wines. 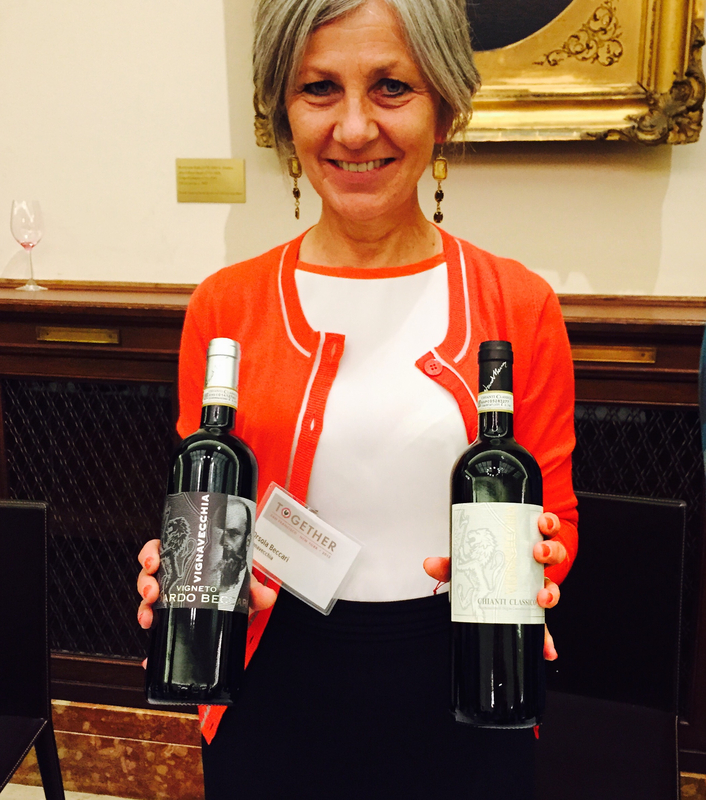 Orsola Beccari, with ‘Vigneto Odoardo Beccari’ Chianti Classico Riserva 2010 and Chianti Classico 2012 on the right. Dark ruby red in colour, with fresh aromas of cherry and peppery spice. Expressing hallmark Chianti Classico characteristics of cherry and bright acidity, the spicy core and clean finish steal the show. Friendly and elegant, much like Orsola herself. Fermented in concrete and stainless steel tanks, no oak ageing. Dark garnet in colour with robust aromas of black cherry, earthy woods and hints of summer flowers. Rich and dense, lush cherry and red berry flavours are balanced by firm tannins, whilst toasted oak, peppery spice and hints of vanilla comprise the velvety finish. Intense but not overpowering, this is a wonderfully balanced glass that keeps you reaching for more. Fermented in concrete and stainless steel tanks, aged in oak barriques for 24 months.